On the set of Peter Greenaway’s “The Cook, the Thief, His Wife, and Her Lover” (1989). Costumes by Jean Paul Gaultier. Corbis image © Byron Newman. Late last month I had the opportunity to visit “La Planète mode de Jean Paul Gaultier. De la rue aux étoiles / The Fashion World of Jean Paul Gaultier: From the Sidewalk to the Catwalk” at the Musée des Beaux-Arts de Montréal. (Overheard in the “À fleur de peau/Skin Deep” room: a father telling the small boy on his shoulders, “Le créateur aimait faire des robes avec des seins pointus.”) The show wrapped up in Montreal yesterday but will be on tour in the U.S., Spain and the Netherlands in the coming months. (See the international tour schedule here.) If you missed the show, Susan Orlean’s article in the New Yorker captures the mood of celebration surrounding the exhibit. I’m not aware of any Jean Paul Gaultier sewing patterns, but two of the houses where Gaultier worked as assistant designer before starting his own fashion business—Pierre Cardin and Jean Patou—had licensing agreements with Vogue Patterns. On his eighteenth birthday, April 24, 1970, Jean Paul Gaultier was hired as assistant designer at Pierre Cardin. The following year, after a brief stint at Jacques Esterel, Gaultier began work as assistant designer at the house of Jean Patou. In 1974 he returned to Pierre Cardin, working at the house’s Manila studio before launching his own label in 1976. In honour of Jean Paul Gaultier, I thought I’d feature a few early seventies patterns from Cardin and Patou from around the time Gaultier was working as assistant designer at each house. (I may have overlooked some patterns—currently the early ’70s don’t seem to be very well represented in the Vintage Patterns Wiki.) I’ve tried to factor in the time lag between runway presentation and the appearance of a licensed Vogue design, but I should stress that my choices represent a rough guess. Vogue 2405 by Pierre Cardin (1971) Image: Vintage Patterns Wiki. 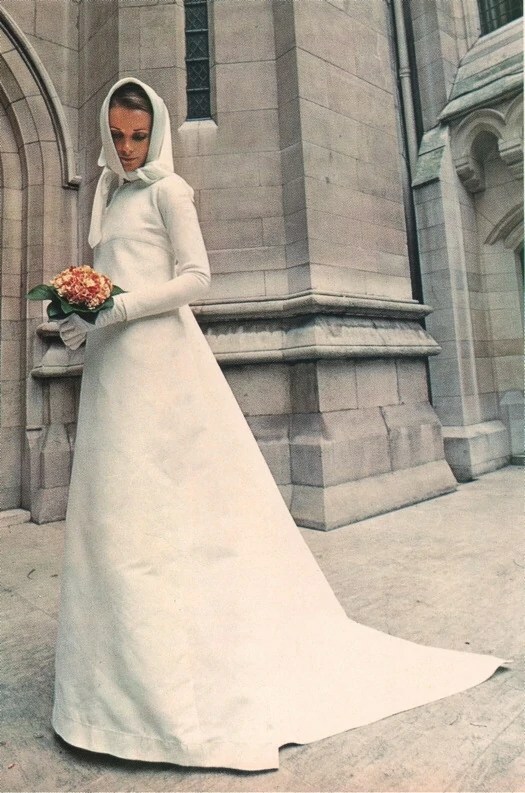 Vogue 2520 is a Pierre Cardin bridal gown: a long-sleeved, A-line wedding dress with high Empire waist and train-like back panel. 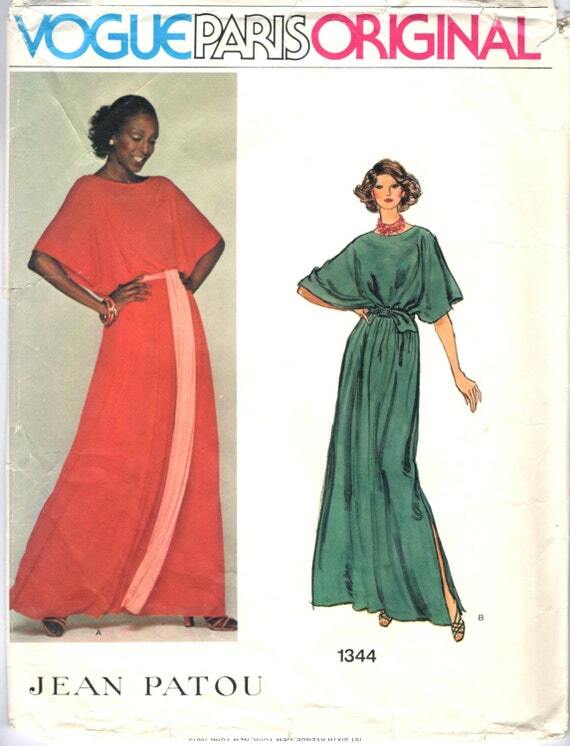 The April/May 1971 issue of Vogue Pattern Book shows the dress made up in a silk knit. Isn’t it lovely? Vogue 2520 by Pierre Cardin (1971) Image: Vintage Patterns Wiki. 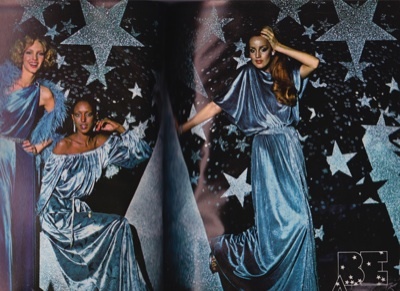 Vogue 1344 by Jean Patou (1975) Image: PatternVault shop. Vogue Patterns, November/December 1975. Image: eBay. Bleeding heart dress, Jean Paul Gaultier Haute Couture Spring 2007. Model: Querelle Jansen. Photo: Marcio Madeira. Image: Vogue Runway. Catherine Deneuve in Gaultier Couture at the 79th Academy Awards, 2007. Photo via Style.com. —from Thierry-Maxime Loriot, “The Rise of a Couturier,” in The Fashion World of Jean Paul Gaultier (catalogue excerpt downloadable here). 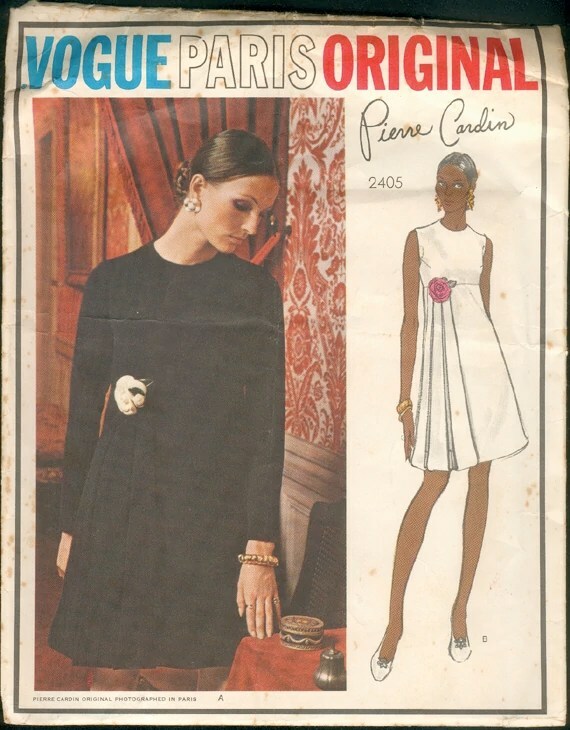 Some time ago, Paco Peralta blogged about a Vogue pattern from the 1980s by Christian Lacroix, Vogue 2184, that he’d found while spring-cleaning his studio. (Read his post here. If you haven’t seen Paco’s blog yet, check it out! He shares both his work as a couturier and his extensive collection of Yves Saint Laurent patterns, often matching them up with vintage images from his personal archive.) Paco wasn’t sure whether Vogue 2184 was the only Vogue/Lacroix pattern, or whether there were others. This post is offered as a sequel and tribute to Paco and his work. 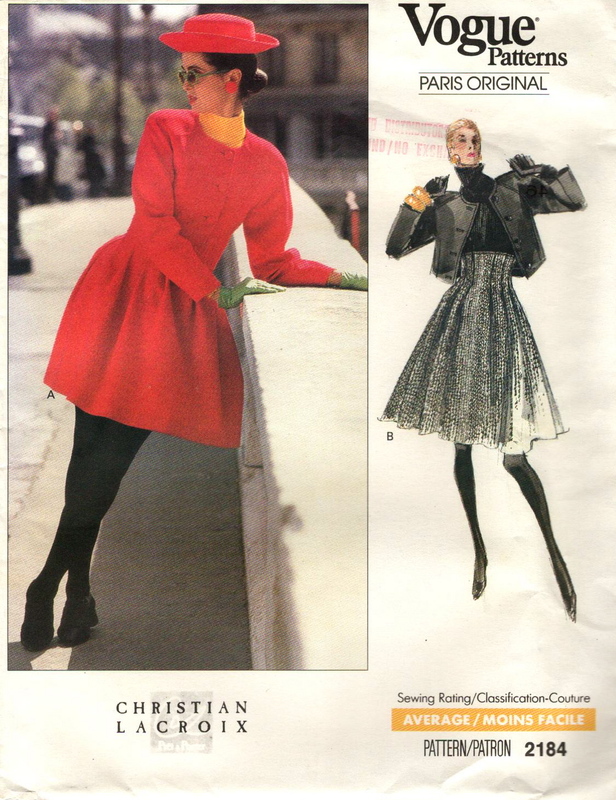 In the spring of 1988 Women’s Wear Daily announced a licensing agreement between Christian Lacroix and Vogue Patterns for a series of three patterns (“Lacroix makes deal with Vogue Patterns,” WWD, April 6, 1988). According to WWD, the three designs selected were all from the designer’s new ready-to-wear collection and would be on sale through the December catalogue from October 1st. Lacroix had presented his first ready-to-wear collection in March 1988, only a few weeks before the WWD announcement, meaning the three Vogue patterns are designs from the Fall/Winter Prêt-à-porter 1988-89 collection. Hand-painted toile de jouy cocktail dress, Christian Lacroix for Jean Patou, 1987. Photo: François Hallard, Condé Nast archives. The three Vogue designs from this collection look to have been photographed on location in Paris. The photos show a short version (view A) of the skirt or dress—presumably the version closest to the original design. 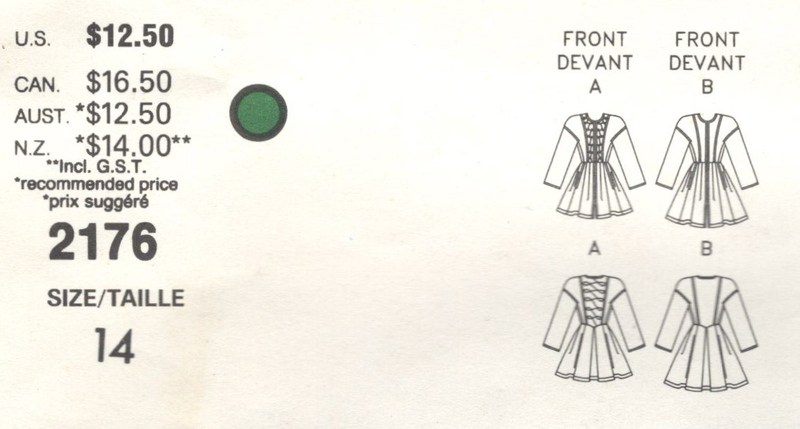 But the illustrations (view B) all show the option of a lower hemline. Here is Paco Peralta’s pattern, Vogue 2184, a cropped jacket and high-waisted skirt that flares from released pleats. The skirt is underlined and has an inside belt of grosgrain ribbon. The envelope description reads: Misses’ jacket & skirt. Loose-fitting, lined, waist length jacket has shoulder pads and long two-piece sleeves. Fitted and flared skirt, above mid-knee variations, has raised waist, no waistband, front and back pleats, inside belt, pockets and side zipper. Purchased top. Here’s the envelope description: Misses’ jacket & skirt. 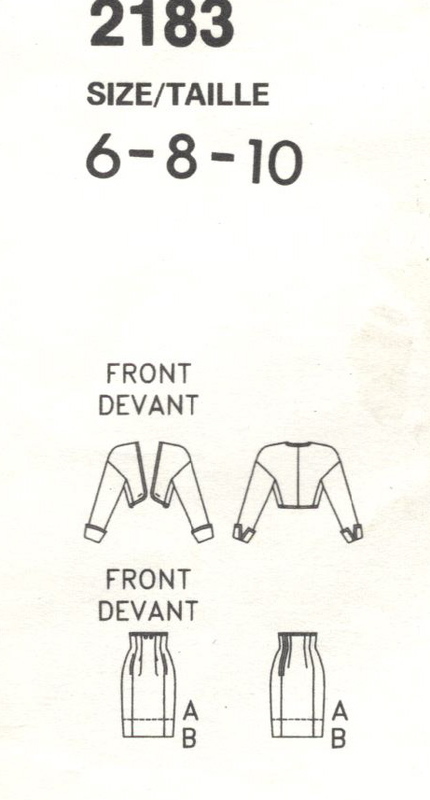 Semi-fitted, lined, above waist jacket has dropped shoulders, shoulder pads, side panels (no side seams) and long, two-piece sleeves with cuffs. Tapered skirt, above mid-knee variations, has raised waist, front pleats, side panels (no side seams), side front pockets and side zipper closing. Purchased top. The envelope description reads: Misses’ dress. Dress, above mid-knee variations, has dropped shoulders, shoulder pads, close-fitting, shaped back bodice, princess seams, side panels (no side seams), flared, pleated skirt, pockets (slightly forward), front zipper and hemline slit, stitched hems and long sleeves. A: purchased trim. No provision for above-waist adjustment. Vogue Patterns catalogue, December 1988. Image: eBay. 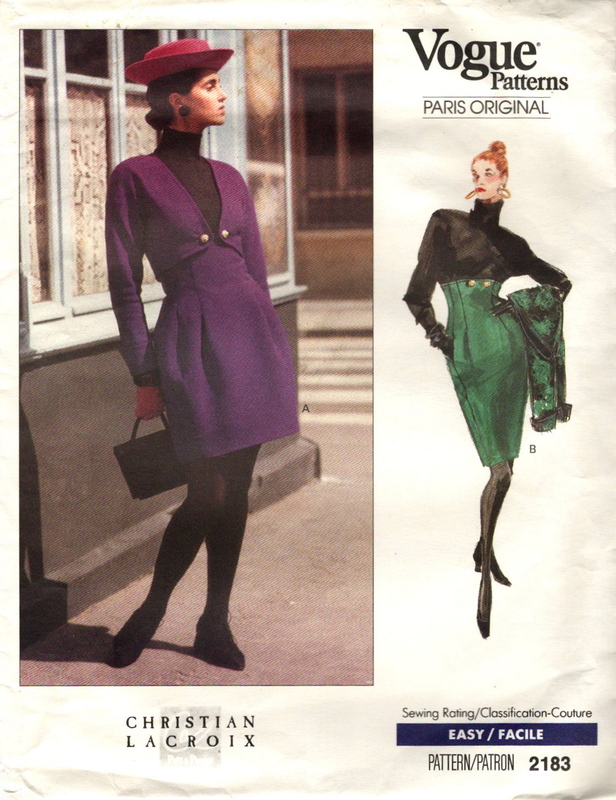 Vogue 2176 by Christian Lacroix, Vogue Patterns, November/December 1988. Model: Julie Anderson. Image: eBay. Christian Lacroix ready-to-wear: smocked coat dress in wool and Zamori cashmere, worn over a turtleneck bodysuit, also Zamori wool. L’Officiel, June 1988. Photo: Mark Arbeit. Image: jalougallery.com. 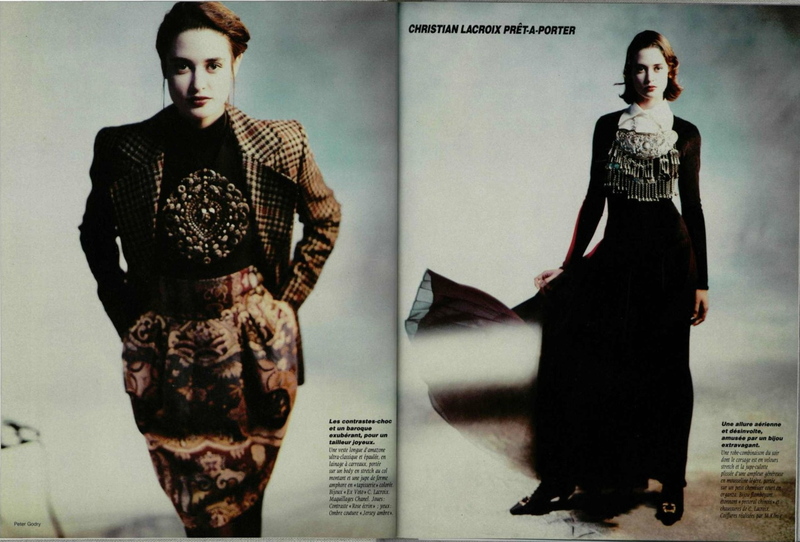 Christian Lacroix ready-to-wear, L’Officiel, August 1988. Photo: Peter Godry. Image: jalougallery.com. According to the WWD article, more Lacroix designs were expected to be added “for next spring and each season thereafter.” But I have a feeling the first set was also the last. The ’88 Lacroix patterns seem to be fairly rare, suggesting their sales may not have met expectations. Or maybe the big shoulders and skirt volumes were too perfectly ‘eighties’ for home sewers, post-Black Monday. What I was surprised to see were the barrel skirts, familiar to me as a trend in the early 1960s (and also, apparently, in 1917), showing the breadth of Lacroix’s references and fashion’s continual re-incorporation and renewal of its past.